The deep wave texture for hair weaves great. If the water wave texture has more pronounced waves than the body wave texture, then the deep wave texture goes further...in fact, you might say it goes... deeper. The wave pattern differs from the water wave pattern by having deeper troughs which makes the waves... well... um....deep. The images below show you the intensity of the ripples in the deep wavy look and from afar, could be mistaken for soft curls. Who Can Wear Deep Wave Hair Weaves? The deep wave texture is a fun and chic look that can be worn by all... It's what you might call an all-inclusive texture much like the beloved body wave texture, the luscious loose wave textures and the wonderful water wave texture; so whatever your natural hair texture you can wear this weave hair texture with panache. If you’ve read any of our other articles on weave hair textures, then you’ll know that deep wave weave hair is widely available in lengths ranging from 8-28 inches; and if you've read any of the other guides a on weave hair textures, you'll also know that longer lengths are available but will require that you spend a bit of time searching...but don't worry, you'll find those longer lengths, just like Marlin finds Nemo. When choosing the length of your weave hair, it's always a good idea to think about whether you will have it cut into a particular style once it's attached; that way if you want a chin-length bob, you'll by the right length. Those versed in weave wearing will know that as you can buy remy weave hair and non-remy weave hair, but you might not know that a weave hair newbie is the so-called "tangle-free non-Remy hair"... (no word of a lie, we saw it first hand). ...If you're wondering why anyone would want weave hair of different lengths, wonder no more; it can make a difference if you're aiming for a layered look or one overall weave hair length (the guide about how to make a wig from weave hair does a superb job of showing how different lengths of hair can be used). Everything. 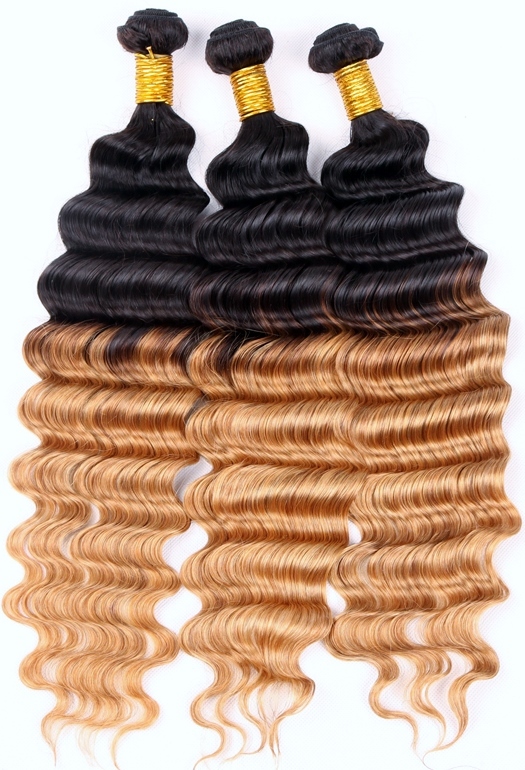 Deep wave weave hair is available in jet black, dip-dyes, T-colours, browns, ombre, auburn, pastels, lowlights, honey blondes, highlights, caramel blondes, greens, platinum blonde, blues, copper...you name it, you'll find it. If you have a darker skin tone and would like some tips as to which colours complement your skin tone and if for some reason non-naturally occurring hair colours aren't your thing (and they don't have to be) then why not check the hair colour guide for darker skin tones. If you're unsure as to which colours would complement your skin tone, why not check out our guide to hair extension colours and skin tones. You can peruse Peruke’s Caring for Weave Hair Guide for an overview of daily styling, combs and brushes for weave hair and use the following five top tips to get started. 1. As the hair has been chemically treated to achieve texture, it's better limit the use of heat straighteners as frequent use can sometimes prevent the wave pattern from returning its uniform wave state. 2. As the deep wave textured weave hair has been chemically treated to achieve its texture, it's better to use a shampoo for chemically treated hair when you wash your weave hair and either use a leave-in conditioner or deep condition to repair and strengthen the hair. 3. If the ends become dry then using hair oil that nourishes the weave hair on damp hair should smooth and hydrate the hair. 4. Moisturizing regularly with a light moisturizer that's free from mineral oils will help keep the hair hydrated and prevent it from becoming dry. 5. Hair extension products shouldn't be used anywhere near the glued tracks in glue-in weave hair (the glue can become sticky which could cause the weave hair to come loose or your own hair to become matted with the glue). The hair can be cleaned using a dry shampoo. Okeydokey that's the dash through deep wave weave hair, done. If you're after more information on weave hair then check out our Hair Extension Q&A section or you can keep up to date with all our guides and articles about hair extensions, wigs, weaves and hairpieces by joining our blog.